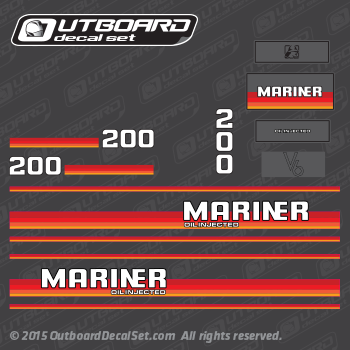 Replica for Mariner outboard decal set custom made for 1984-1989 200hp gray cowling, this decal set may be use on part number 44227A84. 1984-1989 Mariner 200 hp L: 1200412BD L, 7200412ND L.
1984-1989 Mariner 200 hp XL: 1200422BD XL, 7200422ND XL. 1984-1989 Mariner 200 hp ELPT: 1200620 ELPT, 1200622 ELPT, 1200623 ELPT, 1200624 ELPT, 1200628 ELPT, 1200629 ELPT, 7200620 ELPT, 7200622 ELPT, 7200623 ELPT. 1984-1989 Mariner 200 hp EXLPT: 1200640 EXLPT, 1200642 EXLPT, 1200643 EXLPT, 1200644 EXLPT, 1200648 EXLPT, 1200649 EXLPT, 7200640 EXLPT, 7200642 EXLPT, 7200643 EXLPT. 1984-1989 Mariner 200 hp EXLPTO: 1200744 EXLPTO, 1200745 EXLPTO, 1200746 EXLPTO, 1200747 EXLPTO, 7200744 EXLPTO, 7200745 EXLPTO, 7200746 EXLPTO.